As always, we would like to inform you way ahead about another edition of van Scale Model Challenge (SMC). This 7th SMC show will be held on Sunday October 13, at NH Conference Centre Koningshof, Veldhoven, The Netherlands. With the addition of another hall, this year’s event has grown to 5.800 square meters. In cooperation with the Dutch NVM modeling society we present an additional event : Youth and Modeling which will also bring lots of interesting stuff for the “older youth”. SMC 2013 will be hosting again some of the finest top modelers to show you their techniques, tips and tricks of the trade: Radek Pituch (PL), Pepa Saavedra (E) , Fernando Ruiz (E), José Brito (P) and our steady value by now: Jay Laverty (GB). We thought that the competition also needed some adjustments: we amended the civilian classes and the diorama classes are no longer limited to military subjects. For aircraft modelers we have increased the number of classes considerably and we hope to meet the expectations and requirements of this group of modelers even better than before. For figure painters we organize a speed painting contest: painting against the clock. Fun, educational and sometimes hilarious. And you do not need to be a top ace painter to join in. Put any doubts aside and join in. The Speed Painting contest at SMC 2013 is made possible by Heroes and Villains Miniatures from Spain. We invite all clubs to take part in the show by registering their club stands or show table. You can use the online registration form for that, which is available on our website. Don’t wait too long, as space is limited. As for the trade section of the show, we are well on our way of being fully booked and we are happy to say that we have the usual large variety of traders present and several newcomers and surprises coming up. For those that are always on the look for a good deal or vintage kits: fear no more, we have created extra space in the Bargain Corner for specialized traders and private sellers to cater your needs. Interested in taking a stand at the bargain corner: check the website. So there areplenty of reasons to note 13th October on the calendar. Go to www.scalemodelfactory.nl for more information. For all you Facebookers out there; check out our SMC 2013 Facebook page https://www.facebook.com/events/451392344909499/, where we will post the most updated info about the show, the traders and other matters concerning SMC 2013. We would like to share the latest news in our SMC 2013 pre-summer update. This year’s event will be breaking some records in the show’s history. First of all, it’ll be bigger than we ever anticipated. SMC grows from 4.500 to 5.800 square meters. This is partly due to a 33% increase of attending clubs and a list of traders that currently counts 86 names from 12 countries and offers 20% more trade space than in the previous show. The contest has been revised and split up into a figure competition and a non-figure competition, each with its own Best in Show Award. We also have a Speed Painting Contest…with a humorous twist. You’re welcome to join, but there are only a limited number of seats available. So don’t hesitate to register for one of this year’s highlights, and fill out the form on our website. The company Heroes & Villains from Spain supports this contest and provides the prizes for the winner. In a simultaneous event, Youth & Scale Model Technique, visitors will be introduced to technical innovations and techniques that apply to the scale model hobby: laser cutting, 3D printing, CNC milling and there will be plenty of opportunities to actually put techniques into practice yourself on this interactive event. We will also present the “Game Zone”, an area dedicated to table top gaming with demo games and painting demos by clubs and with traders that cater for table top gamers and figure painters alike. Pre-registrations for the contest get a discount on the fee, so why not take advantage of our offer? Please go the website and register your models now. For those who wish to enter the competition, pre-registration is possible until October 6. After that you can only register at the show on October 13. The fee for pre-registration is € 1.50 per model. Entries on October 13 pay € 2.50 per model. The good news is that you pay for 5 model s maximum. Any number over 5 models entered are free of charge. This year we introduce a separate Best in Show Award for the Scale Modelling competition and one for the Figure Painting competition. We have a few seats left at the Speed Painting Contest. If you want to join this serious figure painting challenge, with a slightly humorous twist, fill out the online form on our website and go for a ruthless victory in this event. We have 43 clubs and private exhibiters from The Netherlands, Belgium, Germany, France, Hungary and the UK as our guests which a significant growth compared to 2012. We also note a record number of traders this year. Divided over 90 stands you can find almost 100 companies represented at SMC 2013. Our special guests this year are Pepa Saavedra from Spain, who will show you how she brings her figures to life with an airbrush, Fernando Ruiz, also from Spain, who will demonstrate painting faces with acrylics and Jay Laverty from the UK, who will demonstrate various weathering applications with oil paints on aircraft models. Radek Pituch from Poland will talk about his modelling and modelling philosophy during his presentation and José Brito from Portugal will first demonstrate weathering techniques using MIG Productions products and will subsequently conduct a workshop where you can apply these products and techniques on your own models. Everybody is invited to join this workshop and to bring their own models where José will show you how to get the most out of the MIG Productions weathering products. On our website you can find all details necessary for entering the competition and the Speed Painting Contest, the list with traders who will be more than happy to bring your pre-orders to the show, links to reservation tool of NH Conference Centre Koningshof, directions to the show, the program of the show and the time tables for the demonstrations by our special guests, and much more. 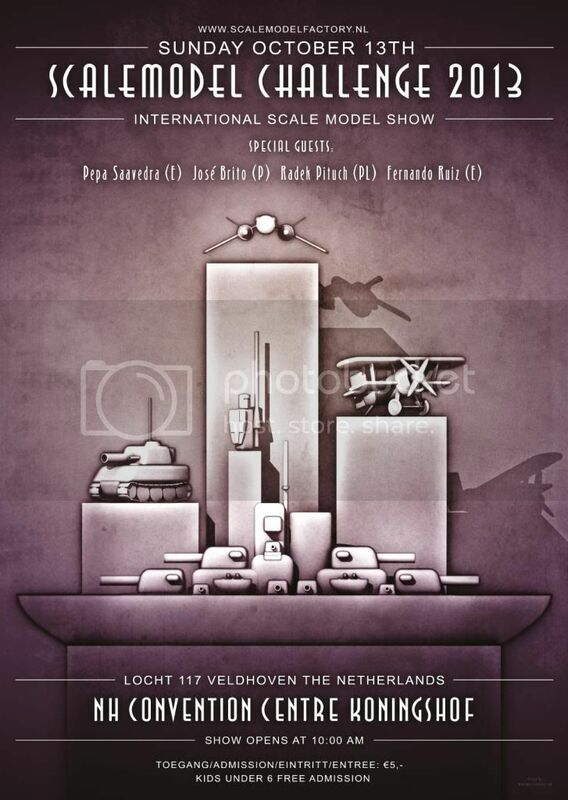 Go to www.scalemodelfactory.nl for all info. See you on Sunday 13th October! The dust of SMC 2013 has cleared. We have risen from our comas and are already making the preparations for next year. On our website www.scalemodelfactory.nl you can find all competition results, images of the contest models and a short video impression by our friends from Massive Voodoo. Please go to “HISTORY”section in the main menu. More (moving) pictures will be available shortly. We hope to see you all again at the next edition of Scale Model Challenge, on 12th October, 2014.